Fit or fat? Big Data Body Sizing declares the weight is over. We change. The world changes. Big Data is the latest in our evolving understand of the world around us. Big Data Body Sizing flips the perspective. Statistics paint a picture about the world population, regions, countries or a research group and apply that to you. Big Data Body Sizing starts with you and aggregates, creating a flow in the other direction – from you to the local friends and family or out to the global community. Big Data Body Sizing is the ability to change personal health as well as effect worldwide well-being. These are final thoughts about the inspiration and understanding of Big Data Body Sizing. Big Data Body Sizing is most definitely NOT medical advice, nor is it derived from medical research on any level. Big Data Body Sizing isn’t even an “answer” by any regard either. It is a fresh tackle on the lingering question: Fit or Fat? With the volume, velocity and variety of data available today, Big Data Body Sizing seeks to redefine what Fit and Fat is and to open it to new interpretation. This is definitely not calorie counting and it only need involving micro-managing food if that is your individual strength. Fit isn’t found on the scale. Fit is good health. Fit is capability. Fit is excellence. Fit is ability to help others. 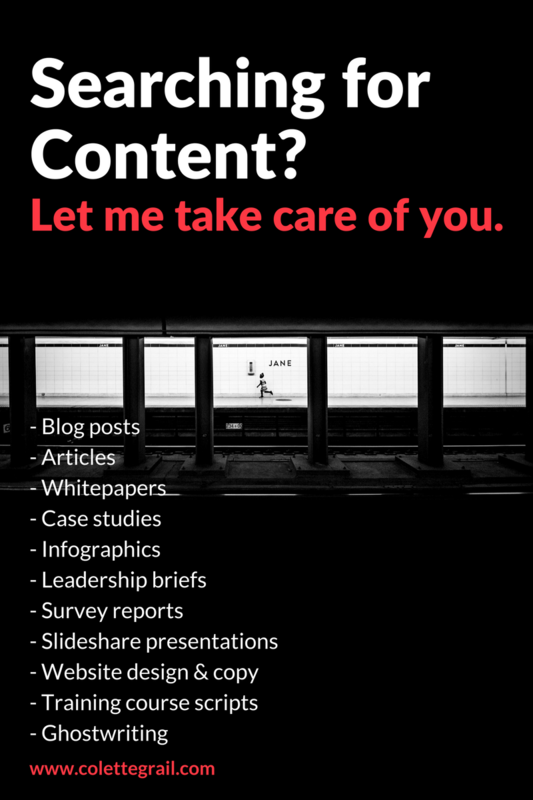 Get off the scale and out of advertising images – create Fit for YOU. Fit is not a stasis either. You are never “there”. Life doesn’t stay the same, waiting for you to step into the same shoes and suit every day. Your body regenerates moment by moment, killing off cells and constructing new tissues and organs constantly. You will have to keep at it. That also means too that periods of doing less. Rest and relaxation are a part of health excellence too. There’s a lot of data out there (in them thar hills), and it’s only going to get bigger. Your data is out there. Although privacy is a far larger issue to address than within this document, your data can be aggregated to a greater good. Using your data responsibly can effectively help your self, the local community, and yes, global well-being. Google proved in 2010 that it could predict outbreaks of the flu in days or hours, which is weeks before the Center for Disease Control. Whereas the CDC uses reports from doctors for office visits for the flu, Google sees spikes in search key words for flu remedies. How can your data make a difference? Your data can be anonmyzed and incorporated into larger data lakes. Sell your data to companies. Pharmaceutical companies and drug stores can develop for product and service improvements – maybe just for you. Send (or sell) your data to local or regional health providers, such as physician groups, hospitals, and emergency/first responders. Big Data enables these groups to develop a better picture of what the health care needs are for the community. Donate your data to research facilities and volunteer organizations to assist traditional research methodology in solving the big challenges – cancer, diabetes, heart disease. Donate to humanitarian organizations for implementation of emergency assistance, disaster relief and health education. Big Data Body Sizing is an idea. This isn’t a product or program or service in place for you to buy. 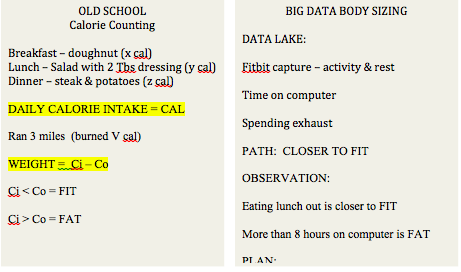 Big Data Body Sizing hopefully inspires the diet and fitness industry to consider Big Data plug-ins as a new venture. Independent developers create apps for setting the path and plan and apps for narrating health and worth and not pounds and inches. Although a suite of sensors and apps already exist for personal monitoring, it is but a thread started for far more exploration into apps that aggregate data sources that aren’t collected yet. Anonymizing data is a controversial capability as to efficacy. Part of a much larger discussion, your personal data is already pervasive throughout the digital universe. Consider all the financial transactions you already perform daily.